Over the years, BaByliss brought us some of the best beauty products on the market. And, thankfully, the company’s venture into straightening brushes is no exception. Right away, you’ll notice this brush sports a vivid and spunky design. The dark purple colour with glittery plastic looks quite nice on this straightener. But the design is not all about the looks. For starters, the head of this brush is pretty large—perfect for long and/ or thicker styles of hair. That’s not to say fine hair can’t get any use out of this straightener, but short hair and bobs might have some issues making contact with the ceramic heat plates. Yet, on the bright side, the bristles do a great job of protecting your scalp from the heated parts of this iron—which is great for preventing injuries. 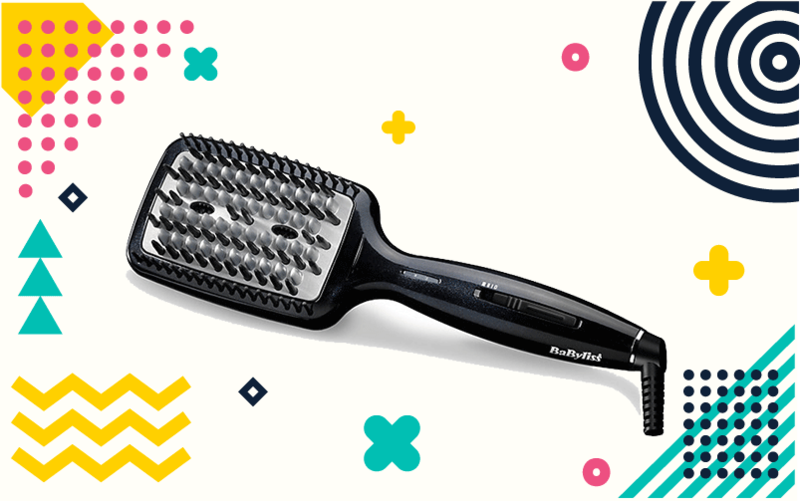 Even better, these silicon bristles do flex—so you can brush through your hair’s tangles quite smoothly. 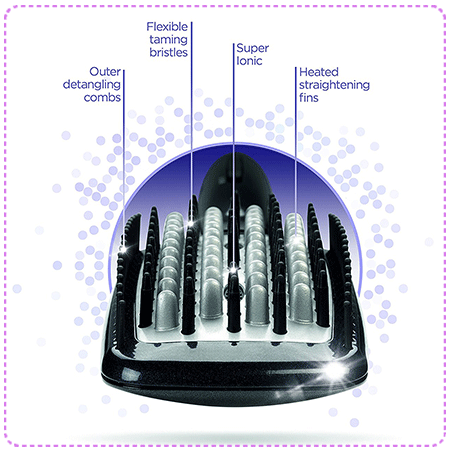 Meanwhile, the diamond-infused ceramic fins do a great job of straightening your hair without any problems. Combine these features with the super-ionic frizz control, and you’ll be getting some salon-quality smooth hair without any frizz or kinks. 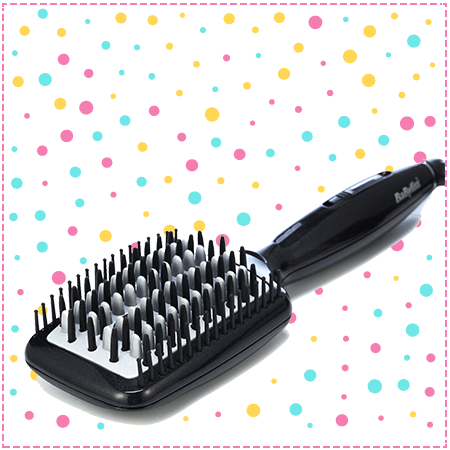 Another nice aspect of this straightening brush is its accessibility. Overall, you select your heating temperature by flicking a switch. And LED lights confirm your settings. And speaking of these settings, you’ll find three of them (180 degrees, 190 degrees, and 200 degrees-Celsius), which is great for styling just about any type of hair. Also, the brush heats pretty fast—about 40 seconds for the highest settings. There’s even an auto shut-off feature if the straightener sits idle for 76 minutes—so you have a pretty nice safety measure built in. 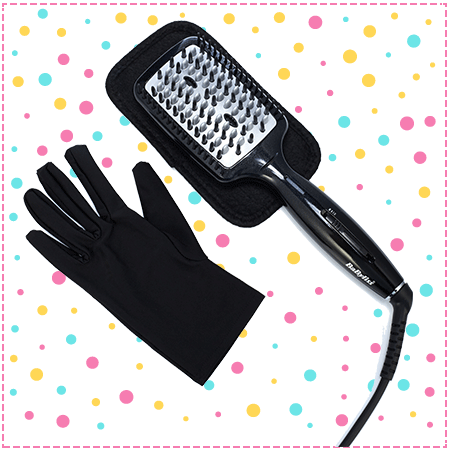 And if that’s not enough, this brush also comes with a heat mat and protective glove to protect from nasty burns. Keep in mind that you’re also getting a long three-year warranty with this brush. So you’re protected should anything go wrong with the parts. Feels lightweight and comfortable to use. Flexible bristles for easy comb. Nice and long power cable. Difficulties in styling short and bobbed hair. Easy to accidentally power off while in use. Overall, BaByliss created a pretty nice hair straightener. In fact, this one does a fantastic job of styling hair in a minimal amount of time. And its large head straightens huge chunks of hair rather nicely. While not the best choice for short hair, this straightening brush styles just about any hair type with a natural, salon-quality finish.